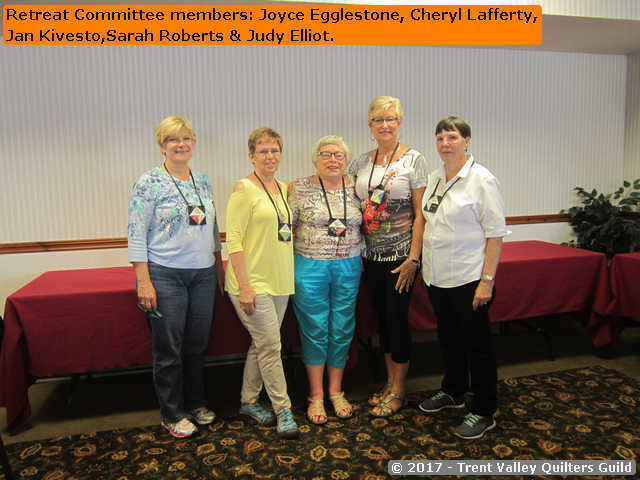 Many Thanks to all the committee members including Louise Oberwarth who was unable to attend the Retreat. 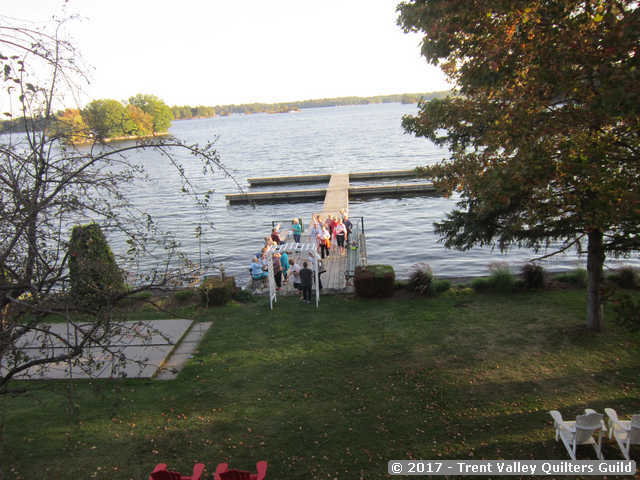 Our Retreat this year was held again at the Glen House Resort, a beautiful spot on the shores of the St Lawrence, located on the 1000 Islands Parkway in Lansdowne Ontario.The resort has an indoor swimming pool & hot tub as well as an outdoor pool. Many of the ladies took the opportunity during retreat to try out these facilities. Not the outdoor pool though – a little to chilly for that. 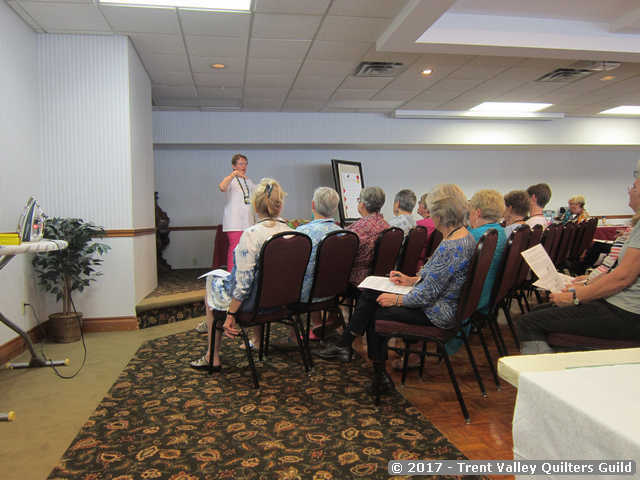 Attendees – and there were many of us – arrived at the resort around 1pm on the afternoon of Tuesday October 3rd, 2017. We were greeted by the retreat committee and each of us was presented with a gift bag on registration. 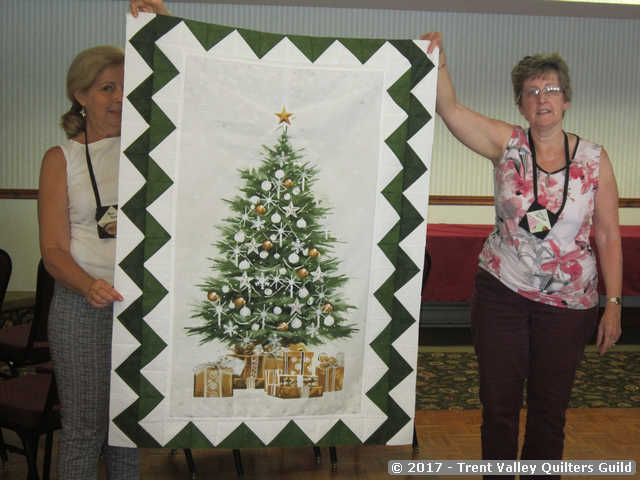 Those participating also had the opportunity to drop off our Christmas placemats, an entry for a prize draw being provided for each mat donated. 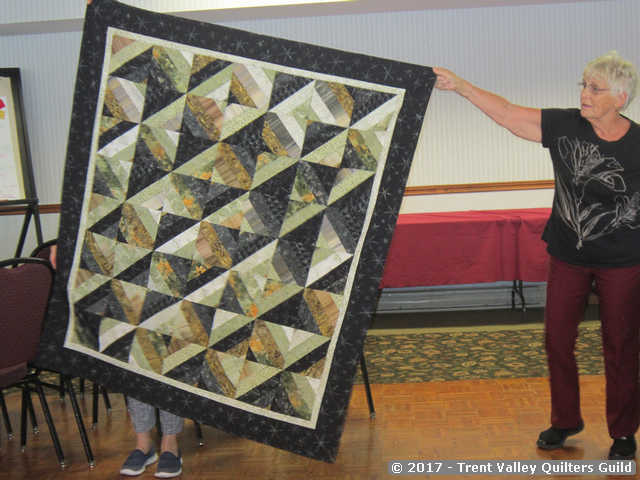 Prizes will be drawn at the December Quilt Guild meeting. 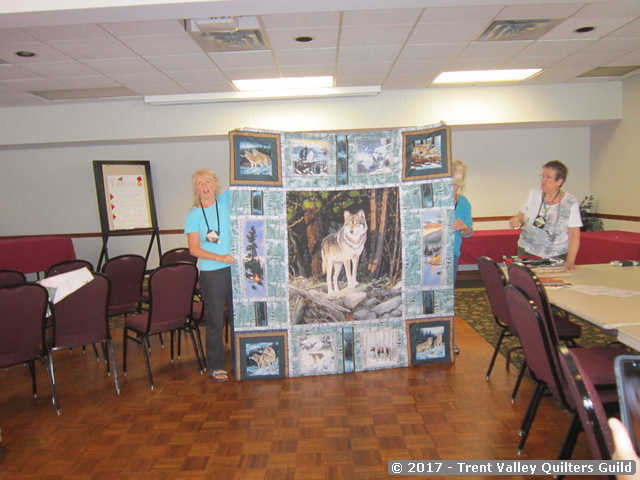 The Christmas placemats are donated to “Meals on Wheels”. We had a nice bright well-lit room to complete our sewing projects. All of us fit into the one room and we had a large table each to set up our machines. 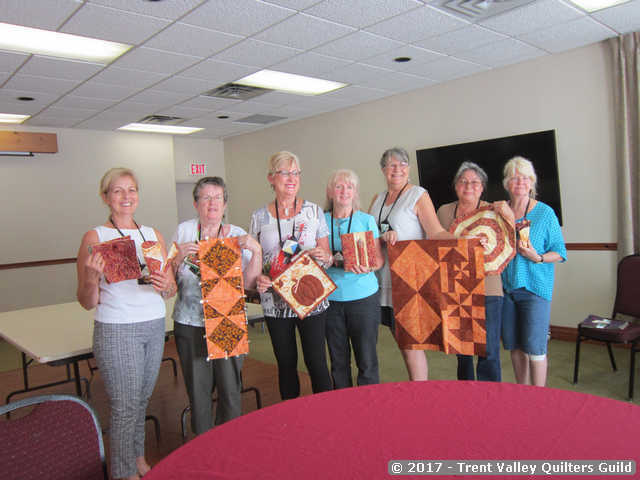 Many of our quilters were putting together blocks for the “Tea Time” quilt taught by Jan Kivisto. 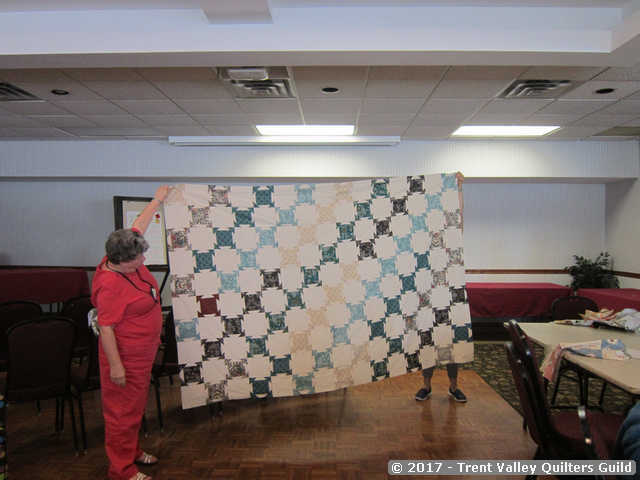 Others were working on their own projects.Karen Magee of Quilt Thyme in Kingston attended throughout the retreat and we had access to many great bargains and wonderful projects/ideas. We saw many active shoppers at Karen’s tables. 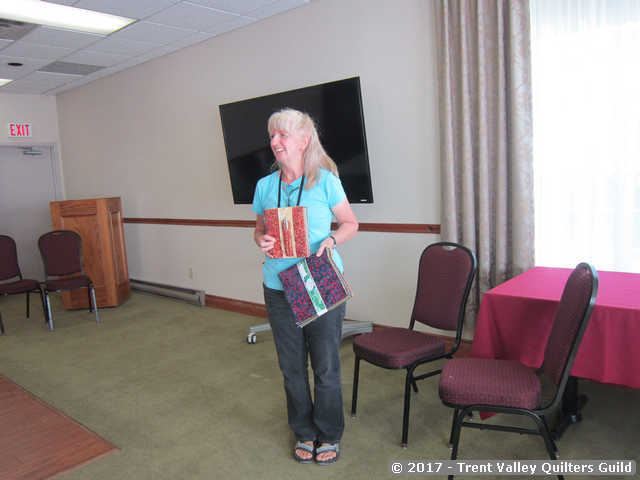 Karen provided everyone with 2 pieces of fabric in our gift bags and sponsored a competition for who could make the most creative item out of the fabric. Kathy Braun won with her book cover. 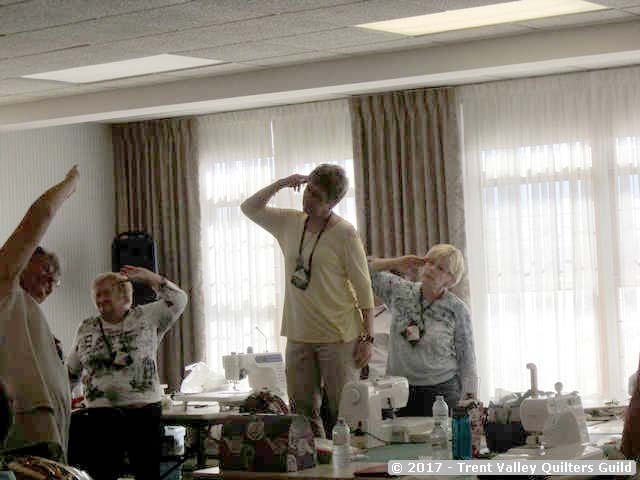 Throughout the 3 days of the retreat the members of the retreat committee gave us some entertaining demonstrations. 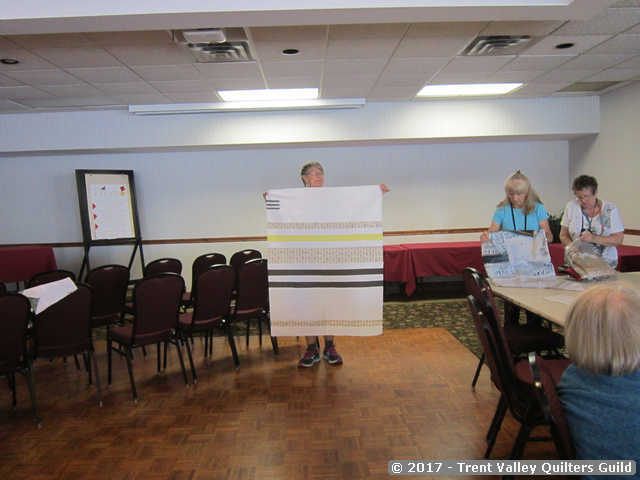 • Joyce Egglestone demonstrated the ten-minute table runner and how that could be reconfigured into a wrap bag. 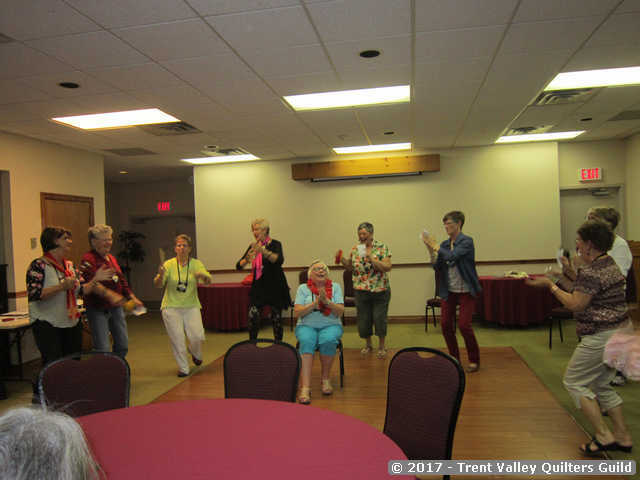 Jan Kivisto lead an exercise session on the last day of the retreat to make sure we were all fit for the drive home.We had a social event on the evening of October 4th with the silent auction draw. There were many excellent items for the attendees to bid upon and the participation was competitive. 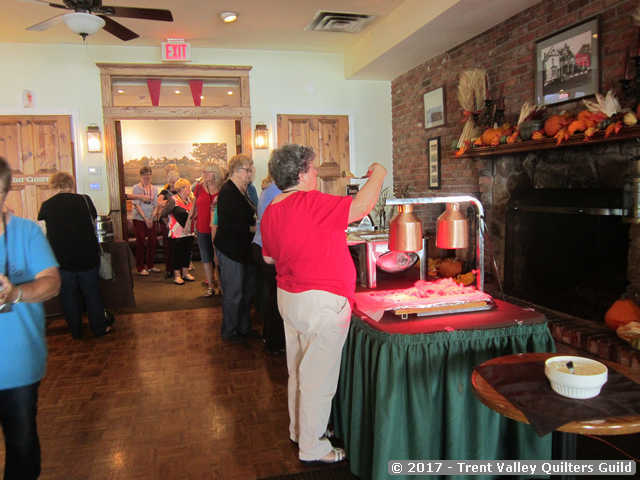 There was a celebration for Joyce Egglestone’s 80th birthday.We were fed very well by the resort, breakfast, lunch and dinner. Each day there were centre piece prizes at the tables & favours for everyone at Lunch & Dinner. 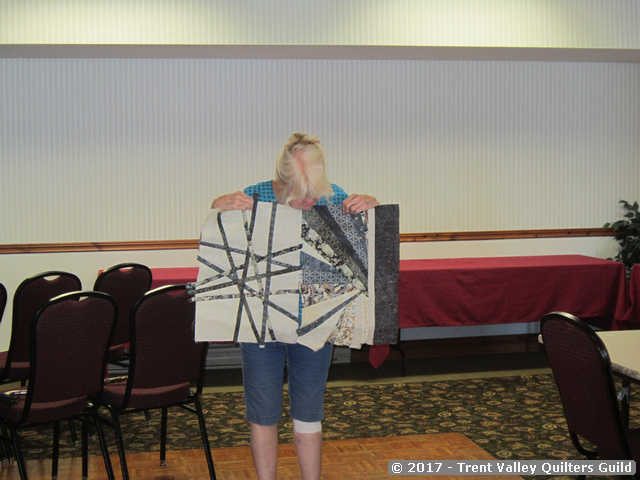 We also had draws for multiple prizes which took place at show & share to wind up the retreat. 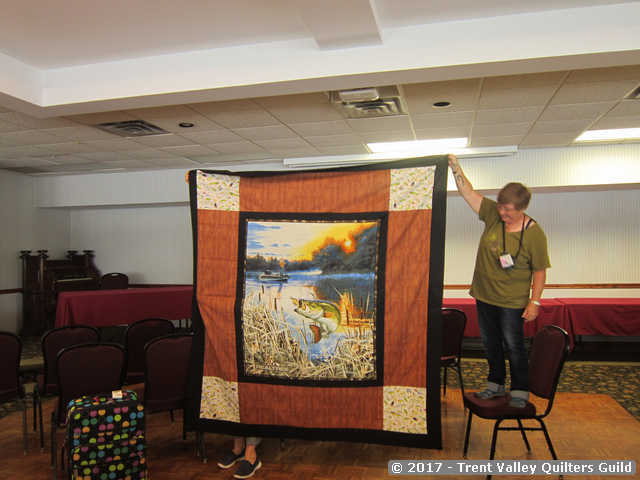 It was great to see what everyone had created over the three days especially the many different versions of the Tea Time quilts.